There are some excellent companies featured on this site, that will allow you to buy structures that will work well for a tiny cabin! 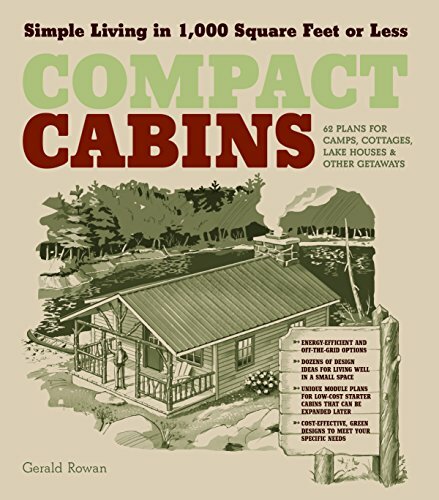 You can also purchase plans, and build your own tiny cabin. ​ some awesome cabin decor here, too. Compact Cabins presents 62 design interpretations of the getaway dream, with something to please every taste. Best of all, these small footprint designs are affordable and energy efficient without skimping on comfort and style. The cabins range in size from a cozy 100 square feet to a more spacious but still economical 1,000 square feet, and all include sleeping accommodations, kitchen and bath facilities, and a heat source. Complete chapters on low-maintenance building materials, utilities and appliances, and alternative energy sources supply readers with the options for living efficiently in small spaces. Stoltzfus Structures​ are the best of the best! Click on the pic above for more information and pricing on this perfect tiny cabin!